RMBR plays host to the Singapore Shanghai International School (school set up by Singapore in Shanghai for expatriates working there). 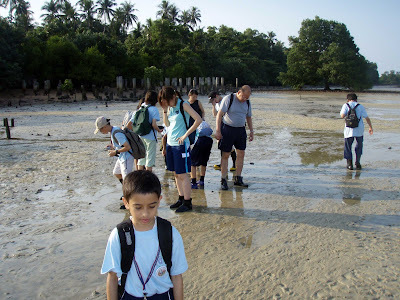 The students are here for 5 days and in their itinerary, Semakau Landfill Intertidal Walk was one of the attraction. As you can see, they were a curious lot! This was the beginning of the walk and theirs eyes were everywhere. 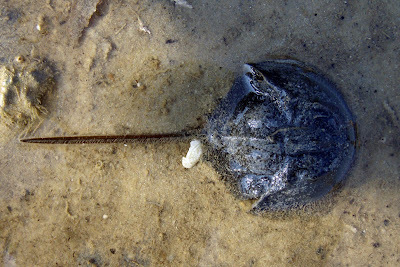 We came across this baby Mangrove Horseshoe Crab (Carcinoscorpius rotundicauda), it was a juvenile. The Mangrove Horseshoe Crab has a tail that is round in cross section, vs the Coastal Horseshoe Crab (Tachypleus gigas) which is triangular. 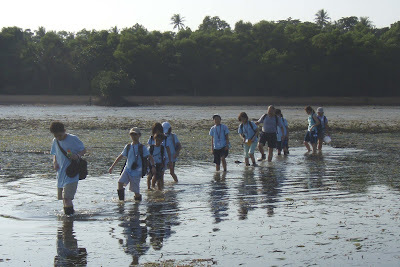 In single file, they crossed the Sea Grass meadow, and pulling their shorts and pants along the way. 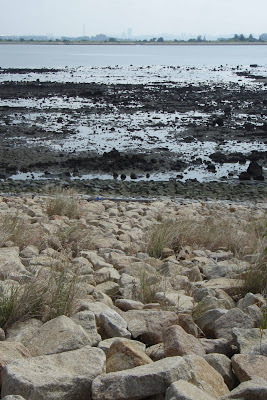 Afraid of getting wet, it will be a vain attempt - for coming back the tide would have raised the level! Surely their pants will be wet. 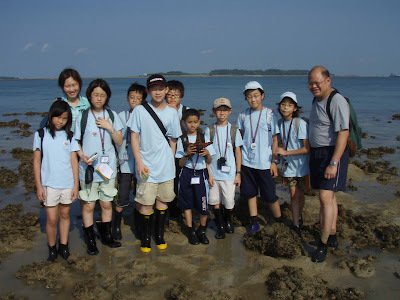 Demonstrating to the students that Sea Cucumber (Holothuria scabra) will right itself when placed upside down, the picture below shows just that. 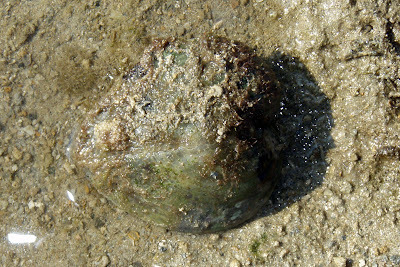 We found a bigger than usual Heart Cockle (Corculum cardissa), a bi-valve but open its shell sideway, just like the pincer of the crustacean. 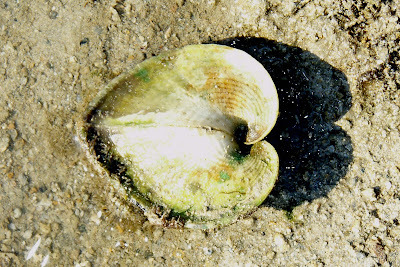 Another view of the Heart Cockle, but the side that lies on the sea floor. 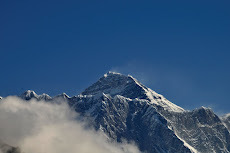 Here the parting-line is very obvious. Trodding along, the Fiddler (that is the name of my group) made it to the Coral Rubble area. 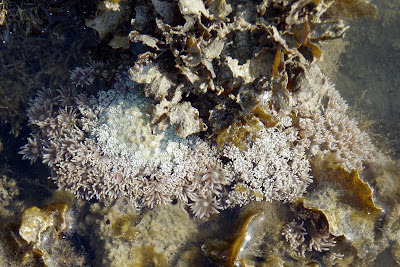 Soft and Hard Corals abound, but today the weather was hot and most sea creatures preferred to take their siesta than to come out and display, except for those that are still covered with water. 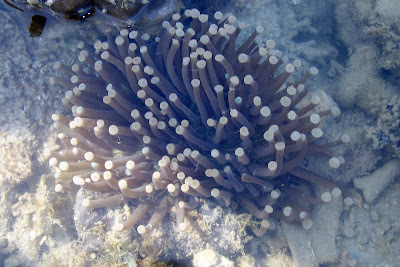 Below is a mushroom coral (Heliofungia actiniformis) with its long tentacles. It must have been the heat, for most creatures just "disappeared". 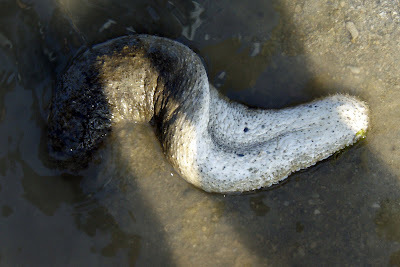 We managed to locate one Knobbly Sea Star which normally should be a couple. Still, a memento we must have, and here you can see the Fiddlers with it. On our way back, we came across this Noble Volute still in the process of laying eggs (Cymbiola nobilis). The egg capsules is translucent and somehow "mathematically"it does add up. 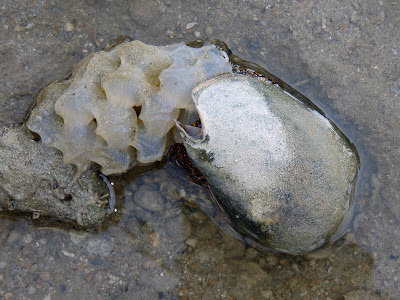 How did those mass of egg capsules come from that shell? Today seems to be a very odd day - the tide at its lowest should be 0.3m but it seems to be lowered than that, and the tide seems to be in this stage for a long time. We arrive at 8 am, and left at about 10:30 am, and there seems to be no change to the tide. At least the Fiddlers did not get more wet than I have predicted!! !